In my fair Saitama prefecture are many natural wonders, much to my delight. A mere 20 kilometers (12.5 miles, roughly) from my city is Chichibu, a city that is gaining more popularity with tourists as its natural wonders and festivals gain visibility. Getting there takes over an hour, due to having to go around several mountains, but the trip itself is a scenic train ride through forests, across small streams, and into the more rural, nature-filled areas outside of Tokyo. 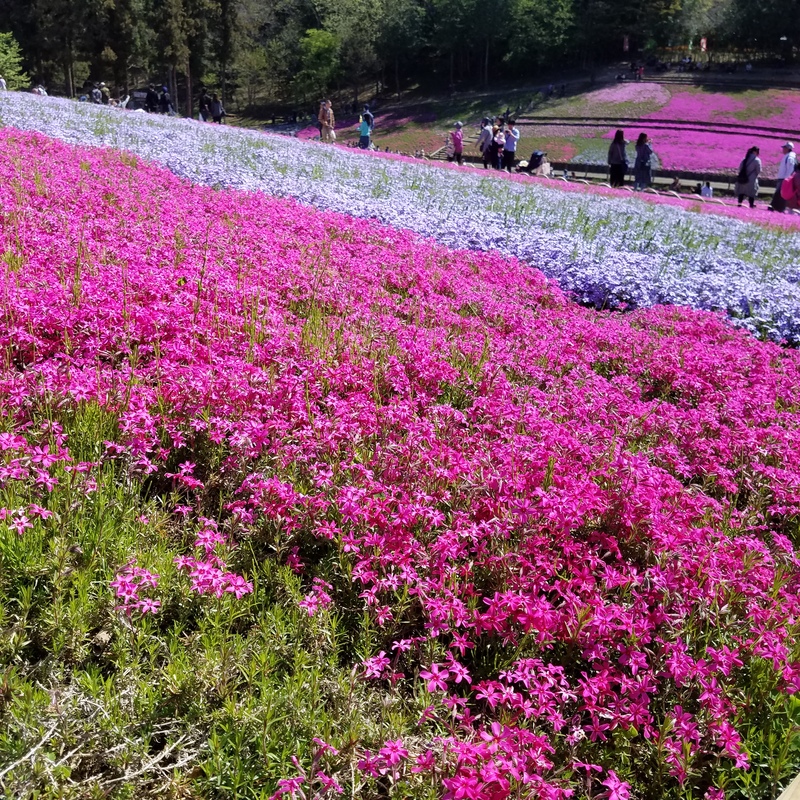 One fine spring day, I ventured forth to check out the flower-filled Shibazakura hills in Histujayama park. The park is known for its hills covered in tiny flowers. For the more botanically-inclined, those flowers include McDaniel Cushions, Scarlett Flames, Autumn Roses, Little Dots, Tama River’s Currents, Amazing Graces, Oakington Blue Eyes, Emerald Cushions, and Mont Blancs. The Amazing Graces and Tama River’s Currents have these amazing little speckles of red around the center of the flowers that really catches the eye when you bend closer to examine them. The hills are covered in these flowers in spring, and the non-flower hills and overlooks around them are replete with sitting, where you can enjoy a small picnic as you soak in the sun and enjoy the vibrant colors around you. Chichibu city isn’t the only place in Japan with a Shibazakura Festival, but Chichibu’s has this homey local feel to it, making it a bit more intimate with its atmosphere. The vendor areas are pushed discretely to the sides, allowing for maximum flower gazing. In addition to staples of Japanese festivals (fried goods, ice cream, meat on a stick, etc. ), there is a huge variety of flower-based goods to purchase. They make flower-flavored soft serve as well as flower noodles. The item we ended up getting was some locally made honey, using pollen from all the flowers we saw on the hills. It has this wonderful floral scent and just the slightest bit of sweetness to it. It was a really nice treat and has served well to sweeten our tea since! Chichibu is this wonderful little spot tucked away from the hustle and bustle of urban Japan, and with such charm and plentiful festivals in its calendar, I look forward to making the trip out there again in the future!